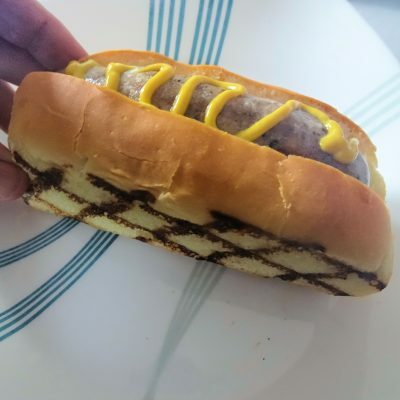 In prior posts, I show you how I make White Hot Dog Buns and Whole Wheat Bratwurst Buns. The way I make these buns comes out as New England Hot Dog Buns. New England style hot dog buns are narrow with straight sides. They are meant to be cut into from the top, not the sides. So why do I prefer this style of hot dog bun? The straight sides let you grill them and that makes a hot dog or bratwurst even better! Just take the bun and butter both straight sides. Grill the buns for the last couple of minutes you are cooking your hot dog or bratwurst. Cut a slice almost all the way through the bun from the top. Load up the bun with toppings, tuck in your hot dog or bratwurst and enjoy! Never heard of this before. Seems like the toppings might stay in place a bit better too? I hadn’t heard of it before a couple of years ago. Now, they are the only hot dog buns I make. They do let you pile on the toppings. I don’t know that is such a good thing when you are the Old FAT Guy though.